Subedar Maj. Pritam Singh: People tell us that war is bad. I ask them, "Who knows this more than a soldier?" Karan Shergill: Then why have wars? Subedar Maj. Pritam Singh: Sir, the Almighty made only one Earth, but Man's greed divided it. This became mine, that became yours. I'm glad the moon is up in the sky. We would have cut it to bits had it been down here. 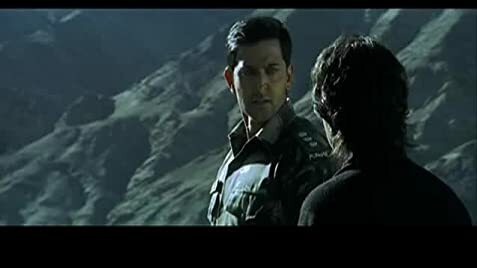 The movie is all about having a LAKSHYA (aim) in our lives. It would'nt be inappropriate at all to comment that this film in one way points out at today's indecisive youth who are not clear about what they are going to do of their lives, and change their focus every now and then. The story is about Karan (Hrithik Roshan) who is very talented but utterly confused about his future. Rather his girlfriend Romila (Preity Zinta) has since the very beginning ambition of being a news channel correspondent. Karan's indecisiveness widens the gap between him and his father (Boman Irani) who expects nothing from his son and the same thing ultimately results in his breakup with Romila too. This changes Karan's life and he gets determined of getting in the army and passes out from the IMA (Indian Military Academy) with a very enviable record. At the same time Romila too becomes a successful news channel correspondent. But both of them don't know what their futures has in store for them. They meet again after the turmoil in Romila's life from a broken engagement and this time the backdrop is the picturesque Kashmir valley and the event being the Kargil war. Karan has been deputed there as an army officer and Preity comes for a live coverage of the war. The story now flows ahead with the attempt of Indian forces to get back peak no.5179 from the Pakistani forces and the intersection of Karan's and Romila's lives at many instances acting as the currents. The ending is predictable but yet you would love to watch it. The movie is yet another masterpiece from Farhan Akhtar,the Director after the tremendous success of "Dil Chahta Hai". This is also yet another testimony of Javed Akhtar's writing prowess. The lyrics and dialogues are superb. Moreover the choreography (Prabhu Deva) and photography (Christopher Popp) are worthy of praises. Hrithik Roshan gives another flawless performance after "Koi Mil Gaya". Another attraction is Colonel Sunil Damle (Amitabh Bachchan). Amitabh Bachchan gives those dialogues a beauty and charm which is so characteristic to himself. Preity Zinta is good in her role too. You can't pinpoint anybody or anything specifically as that would diminish other's efforts as all of them have performed commendably. The backdrop of Kashmir valley and the Himalayas has been so beautifully captured in the frame. Also the war scenes look so much authentic which is very tough job to do. The running time of the film is above 3 hours but you can't realize that ( you can't help it as you get fully engrossed in the film.....). Hrithik's dancing skills are unveiled so beautifully yet again. He can easily claim to have a rubber body--so flexible,so much in tune with the rhythm. Good music from Shankar-Ehsaan-Loy trio once again. Actually i could'nt think of any flaw in the movie as every aspect has been given it's due attention.